When you hear the name Frank Lloyd Wright, you probably think of lovely homes from the ’50s with stunning straight lines and bold colors but not stained glass windows. However, as it turns out. 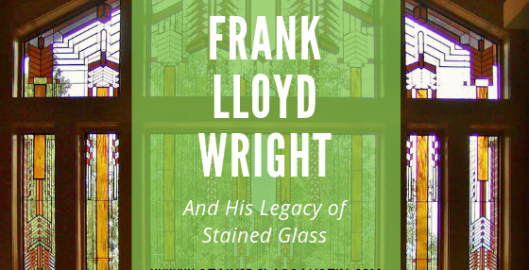 Frank Lloyd Wright was a prolific stained glass artist of the 20th century not by coincidence–of the most influential designers in American history. Although he is most known for his architectural feats and being the father of the “Mid-century Modern” his amazing design sense spanned various mediums from furniture design to graphics arts and, of course–even stained glass. A 70-year career as a designer allowed Frank Lloyd Wright to accomplish quite a bit in his life. He not only made a profoundly lasting mark on the American design scape but also create a ton of amazing stained glass too. All of his designs, stained glass, architectural and otherwise, are as relevant today, as they were back in the early to the mid 20th century. But his stained glass work is truly extraordinary and profuse; he designed well over 4,000 leaded glass windows and doors for over 150 of his buildings. Wright created stained glass for almost any building features that you can imagine: doors, skylights, backlit ceiling panels, table lamps, and wall sconces as well as for window. However, the reason for his success in the stained glass arena– he didn’t think of these windows as traditional stained or leaded glass. Wright has a unique approach to stained glass windows and often referred to them as “light screens”. He viewed them more as Japanese shoji screens rather than a leaded window. As such, he arranged his windows in bands–not unlike shoji screens. Wright’s designs relied heavily on the zinc-or copper-plated came configuration, while all others of the time were still using traditional lead. This type of caming let him create geometric abstractions of natural elements such as plants, trees, flowers and more. His color use was playful but elegant–a mix of solid-colored, iridescent and clear glass and sometimes a hallmark style of gold leaf sandwiched between two thin pieces of clear glass. A revolutionary of his time, he pioneered setting some pieces of his stained glass at an angle which greatly enhanced the reflective qualities of the glass pieces in his windows. When light strikes his angled glass, different colors will appear depending on the time of day. It was this creativity and thorough attention to the various characters of light at different angles that truly set his windows apart and continues to inspire awe today! Here at Stained Glass Austin, we make lovely stained glass in the style of Frank Lloyd Wright, paying attention to the clean lines and refraction of light. If you want to learn more about Frank Lloyd Wright style stained glass windows for your Austin home, contact us today for a free design consultation! Stained glass enthusiasts and art lovers often journey to Europe to find beautiful examples of historic stained glass. Since Europe is the birthplace for stained glass, some of the oldest, existing stained glass is still located there. These historic examples are often housed throughout churches and other houses of worship. For stained glass artisans, we often look to these historical works to discover inspiration and artistic movement. One of our favorite European examples of stained glass is the antique stained glass found in Sainte-Chapelle. 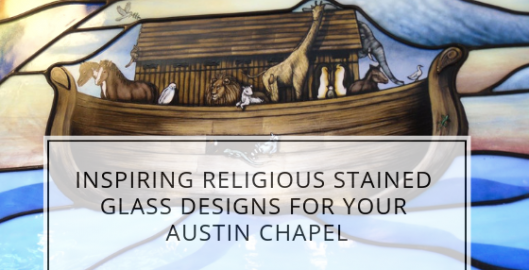 We speak often about stained glass restoration here at Stained Glass Austin because it is a very timely topic for almost any church over the age of about 80 years that has stained glass windows. But the truth is we also do a lot of custom stained glass for our religious clients too–those looking to enhance their temple or church appearance. The reasons vary as to why churches, temples, mosques, and synagogues come to us for custom stained glass but below you will find the most popular reasons. By far the top reason for custom stained glass installation in churches is–it is a stunning addition to any space. The beautiful colors, divine themes and the lovely glow of the Austin sun through these windows makes for an ethereal feel to any house of God. It is an enhancement that makes perfect sense in accomplishing and elevated religious experience in any church, chapel or synagogue. 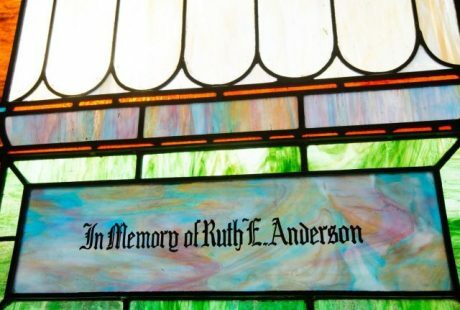 Custom stained glass is the perfect way to pay tribute to a member of a church that has passed by anyone from family to friends or even the congregation itself. It is also a wonderful way for living members to give a lasting gift. Stained glass, so full of life and luster, will truly honor the generosity shown by these members for years to come. Since stained glass is so easily customizable, donations like always reflect the donor’s life and legacy in the church. 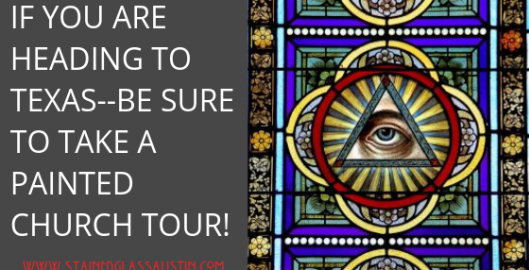 You probably already understand the legacy value stained glass if your Austin church or temple already has it. Like the stained glass that was given to your congregation, installing custom stained glass today is a wonderful gift to the next generation. It is something that is incredibly valuable and a blessing that is only possible with the passing of time and with great forethought. And, it is important to note that our custom stained glass is extremely high- quality and will likely last 150-200 years before needing serious restoration! 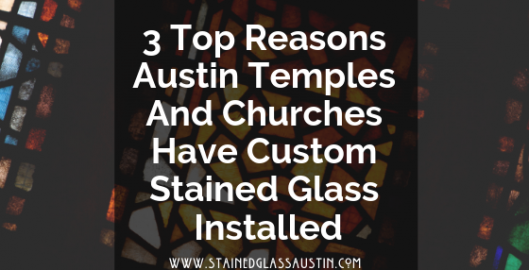 For more information and a quote on custom stained glass for your Austin church, contact us at Stained Glass Austin, today! Many of the churches in Austin have these beautiful, grand stained glass windows that embody different biblical teachings. Stained glass begins to deteriorate around the 75-year to 100-year mark, making it important to consider your options if your stained glass is around this age range. While it may seem easier to just replace your stained glass, restoration offers many benefits that replacement doesn’t. Stained glass restoration can be one of the best investments you make for your church. Restoration offers proper preservation for your stained glass windows, adding to property value and historical value. Many churches don’t even realize just how much their historic stained glass windows are valued at, making it important to find out. Experienced stained glass contractors should be able to provide a thorough, accurate appraisal based on photos alone. Many churches are shocked to discover the actual value of their stained glass, making restoration well worth the investment. In addition to antique value, restoration ensures sentimental and historical value remain intact as well. Stained glass can become a significant part of the community, remaining a part of family traditions and holiday services. 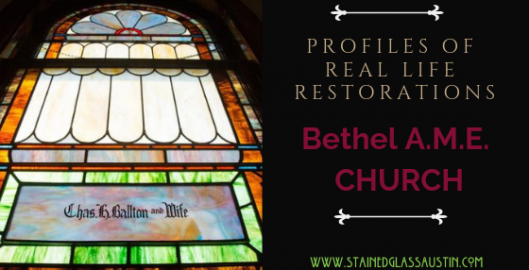 Your congregation and clergy members will thank you for restoring your church’s treasured stained glass windows. Stained Glass Austin: Online Ordering Process from Stained Glass Austin on Vimeo. Stained glass restoration is a highly technical skill that requires extensive training, education, and in-depth experience. The right stained glass studio should be able to provide references, past project experience that’s similar in size to your project, as well as accurate timeline and estimate. A restoration estimate should never be given over the phone– an on-site assessment is required to provide a comprehensive, accurate restoration project estimate. 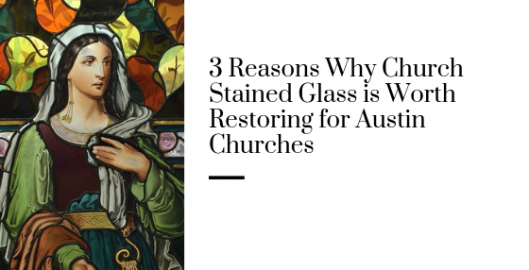 For more information regarding how stained glass restoration can benefit your Austin church, please contact us! Most people have not idea what their stained glass windows may or may not be worth. Which is understandable because values are hard to estimate in general and tend to fluctuate with time and styles. Now more than ever, as the Austin area is going through a renovation boom, finding out the value of your stained glass and whether to keep or replace it, is important. Not all stained glass is worth a lot of money but a lot of the stained glass, has value beyond monetary. And every once in a while there is the case of a vintage homeowner stumbling upon a surprisingly lucrative piece of stained glass they didn’t realize was so rich in history and value. 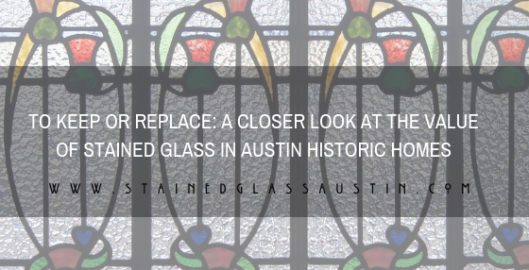 While most historic stained glass will be not be something you can quit your day job for, finding out the value of your Austin home’s glass is critical for things like insurance value and home resale for example. Below are a few things a stained glass expert, like Stained Glass Austin, will consider when pricing your beloved stained glass window. Context Of The Building or Home: The history of the building is a huge part of stained glass value and provides many more clues about the history and maker of the stained glass. Inscriptions and Signatures. 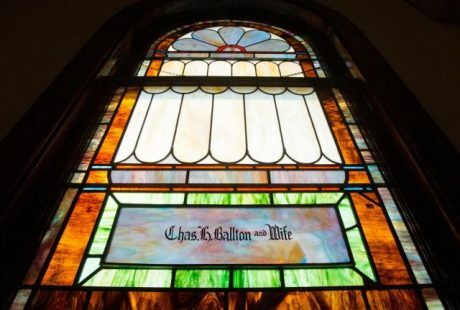 An easy and obvious way to tell the value of stained glass windows is inscriptions on them. These let you know precisely who made the glass or from which studio it came from. Many studios and artists, like Tiffany, put signature plates on the lower right-hand corner or their work. Composition and Style Elements: The style of your Austin window is a very good way to figure out when it was made and even who made it. Styles like Arts & Crafts, Art Nouveau, Prairie School are all distinctive style, coveted and valuable too. If your vintage stained glass is in these types styles, it is easier to estimate the time, area or artist it came from. The Make-up Of The Glass: Of course, the glass is a huge clue in and of itself. There were many varieties of glassmaking methods and innovations, each dating to a different time and style in American history. So, opalescent glass, for example, was invented in 1880 and widely used, in two variations by Tiffany. Before removing or changing the vintage glass in your Austin home, be sure to make every effort to find out and record its history and composition. Also, get it documented for future generation. For help finding out the value of your Austin home’s stained glass contact us at Stained Glass Austin today! 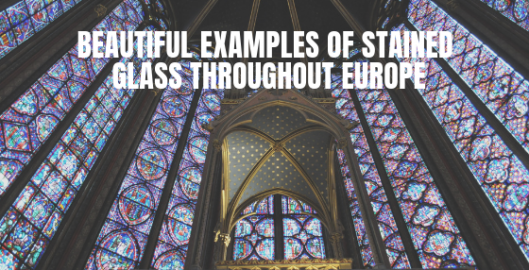 For stained glass enthusiasts, art lovers, and architecture admirers, there are so many beautiful masterpieces throughout the world. 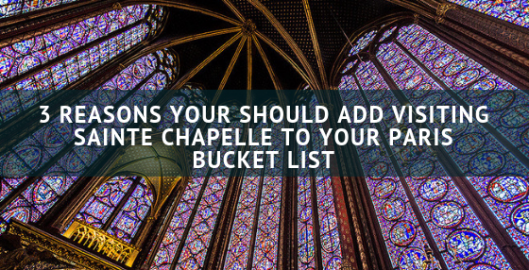 One of our favorite stained glass collections is housed within the Sainte Chapelle located in the gorgeous, historical city of Paris. Their exquisite stained glass collection was built over 800 years ago during a time period where glass was a very rare commodity. This age and time period definitely gives you a deeper appreciation for the detail and size of this stained glass collection. Weddings are a fabulous even in which to gather family and friends to celebrate the love you and your significant other have for one another and make a commitment to a life together. They are also a great way to throw the party of your dreams! They are a time to finally bring together all the elements you have mused about since you were young. Whether it is the pink lady slipper bouquet, the red rose corsages on the groomsmen, a three-tiered cake with chocolate ganache or the lovely scenic Austin skyline to say your “I dos”, everything for this day is carefully curated to make it one to remember. One area of weddings that is seeing an increase in creative ideas are the backdrops at the alters where brides and grooms take their vows. Focusing on this one area of the event is a way to get the fantastic photos of the special moment you crave while at the same time tying all the design elements and colors of the entire ceremony together in one neat small space. Here at Stained Glass Austin, we find ourselves doing quite a bit of custom stained glass for weddings, namely antique style stained glass windows for wedding ceremony backdrops. This is a great idea no only for getting an elegant aesthetic and pictures during the ceremony but as a stylish place for family and friends to take pictures in front of all day or evening. What’s more, stained glass panels are easily moved so you can take them to the reception hall as well. Most importantly, after your big day is over, you have an heirloom piece of stained glass to hang in your newlywed home to commemorate the occasion throughout your married life! In fact, stained glass is so durable you will be able to pass your lovely stained glass wedding panel down to your grandkids and theirs too. For some ideas on what these stained glass panels may look like, explore pictures of some of the very best executed stained glass wedding backgrounds below. 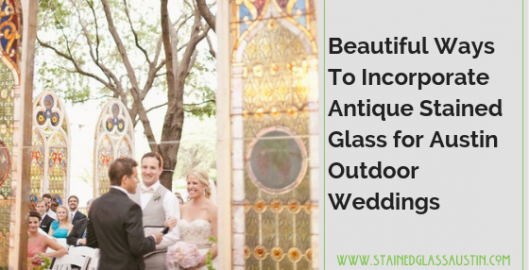 For more information on custom antique style stained glass for your Austin area wedding, contact us at Stained Glass Austin on pricing and ideas.